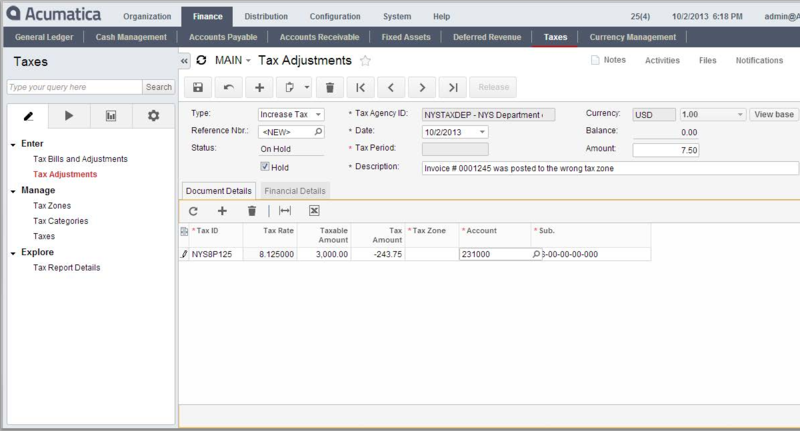 The Acumatica Financial Management Suite Tax Management (TX) module provides organizations with centralized tax configuration, management, and reporting. Being integrated with other financial modules across Acumatica allows you to collect tax information from all financial documents into one single repository and generate reports required for tax filing. Acumatica provides support for Sales, Use, Withholding, VAT and Reverse VAT taxes. For each tax you can specify multiple rates with different start and end dates as well as minimum and maximum tax amounts. Taxes can be calculated on each line item or the entire document amount. Taxes can be calculated on other taxes or only online item charges. The Tax Management module is integrated with all Acumatica modules that require tax calculation. Tax calculation is performed automatically based on the tax zone assigned to customer, employee or vendor record, and the tax category assigned to inventory items. Manual tax adjustments are also possible. Calculated tax is posted to a dedicated tax liability account in the general ledger and to designated accounts in the Tax Management module for future tax reporting. 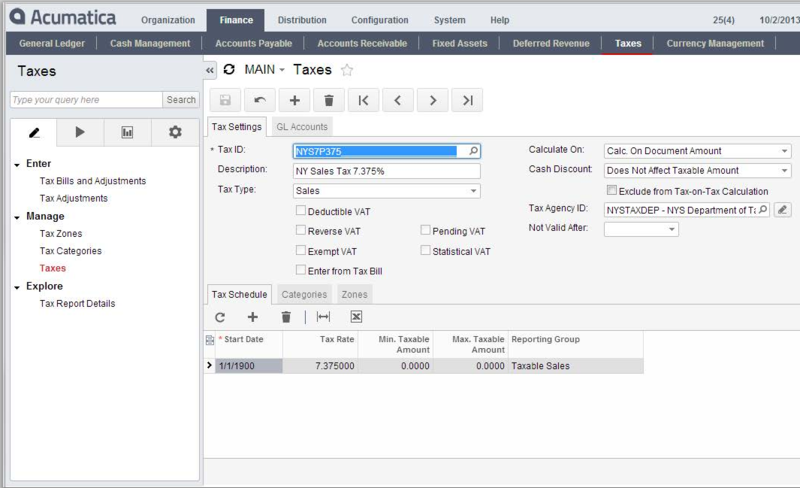 Acumatica allows you to represent tax agencies as vendor accounts. Within the tax vendor account, you can specify the frequency of tax reporting and assign a vendor code to the tax. Each tax period, you can prepare tax reports for the tax vendor and then close the tax period. Acumatica will automatically generate a bill in accounts payable that will offset tax liability for reported period with the AP account associated with the tax agency. partnered with Klear Systems, Inc. can benefit your organization.